Big pillars mean bigger blindspots, Porsche running costs, Why didn't you buy the Turbo? When the Cayenne was released in 2002 it was somewhat controversial. 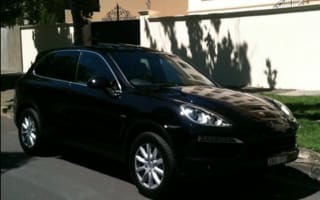 The car was quite ugly to look at, it felt poorly designed when seated inside, and it didn’t drive the way one would expect a Porsche to drive — SUV or not. Everyone expected something better than the benchmark SUV at the time, the BMW X5, and it just wasn’t. The second generation, all-new Cayenne is a different beast altogether. It seems to have shaken all previous criticisms and evolved into something worth pining for. Sitting in the supportive leather seat, the interior feels like it was based on Porsche’s four-door GT, the Panamera, which is no bad thing. The leather, plastics, and metal highlights really heighten the sense of luxury in the cabin. The buttons have an excellent feel to them, and none of the interior panels have that cheap hollowness to them that plagues cheaper (and not-so-cheaper) SUVs. Porsche’s engineers really lifted their game with the new Cayenne. For sure, it’s nowhere near as rewarding to drive as its stablemates, but as far as the luxury SUV sector goes, this is up there with the best of them. It’s a very easy car to drive on a daily basis and at no time do you feel as if you’re behind the wheel of the two-tonne tank that it is. There’s an overwhelming sense of weight and security behind this thing, but not at the expense of its handling or its pace. The Cayenne holds flat around corners and is beautifully neutral in feeling. But it’s the engine that really impresses. The turbo diesel V6 strikes an almost perfect balance between power (176kw), torque (550nm), and fuel economy (7.4L/100 combined). The exhaust note isn’t as horny as the V8 option, but it means the car feels calmer to drive. That endless torque constantly invites your foot to sink into the pedal and propel the Cayenne down the road, in the same absurd fashion as the Range Rover Sport TDV6 or BMW X5 xDrive40d. It’s a very enjoyable machine to captain. Pulling up at the lights will trigger the auto stop/start feature which will turn off the engine to save fuel until you lift the brake, when the engine fires to life in an instant. This particular Porsche also enjoyed keyless entry and start, which means that simply having the key in your pocket is good enough to jump in and drive off. The auto-tailgate was appreciated when carrying a few too many bags of groceries, and I’m sure the soccer mums with babes-in-arms will love it too. Handy features that make living with the Cayenne very easy. It doesn’t have the most luggage space in its market, but it has more than enough to satisfy most families. 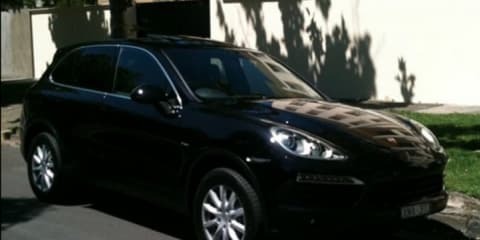 The ride height, coupled with its big doors, makes the Cayenne effortless to enter and exit. If you’re looking at a practical, well-built SUV, it’s very hard to look past Porsche’s latest Cayenne diesel. It’s not going to break any land-speed records, but with a truckload of torque and CO2 figures that are better than a four-cylinder Mazda6, along with practical, real-world features and an excellent design, it’s very hard to ask for anything more in a luxury SUV.